China’s worldview seems to be focusing more and more on competition with America, at its own expense, argues Michael Auslin. After a while, an undertone creeps into discussions with Chinese counterparts on regional and global issues. Whether meeting with Ministry of Foreign Affairs officials, academics and policy analysts, or the media, an American soon begins to sense that part of the conversation is missing. What’s absent is not boilerplate about values, opportunities, or common interests, but rather a sense of China’s broader set of relationships. Ultimately, as one European diplomat put it to me, when it comes to China’s foreign policy, it’s all about the United States. This monofocus on America tells us a great deal about China’s worldview, but it also reveals the degree to which Washington is hampered in forging a better working relationship with Beijing. Unlike the United States, which has had a complex, yet robust set of alliances and more informal partnerships in Asia since the 1950s, China has not formed deep ties with any Asian state. There is no analogue in Chinese foreign policy to America’s relationship with Japan or its initiatives with Singapore. While there is always skepticism abroad about Washington’s true intentions towards it’s Asian partners, and a resignation about the inherently unequal power relationship between America and any of its smaller allies, there is also recognition that the United States usually seeks some type of mutually-beneficial status. Although a superpower (or perhaps because of it), American diplomats have a basic predisposition towards equality in their negotiations and agreements. The U.S. military, for its part, has spent decades helping to train foreign armed forces, provide humanitarian aid, and of course serve as an ultimate guarantor of regional stability, at least theoretically. China’s foreign policy, at least today, is far different. Once it may have seen itself as a co-leader of the global Communist bloc, or as the center of a Sinic grouping of nations up to the nineteenth century. Now, its foreign gaze is centered squarely on its relationship with the United States. Everything else is refracted through that lens. Other relationships are considered for their utility to China’s goals of furthering its influence and countering America’s position, both in East Asia and other regions. 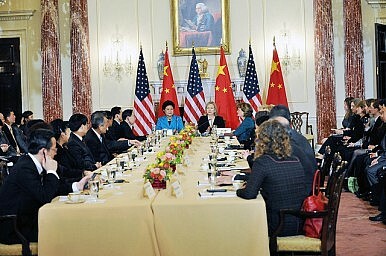 It is this that colors discussions with Chinese interlocutors, lending a sense of intellectual vertigo to any meeting. China, one comes to believe, sees itself operating in an international vacuum, yet the container enclosing that vacuum is America. To break the container is to free China from an artificial constraint, and will allow it to expand naturally into its surroundings, as a gas does when released from a vial. Such a view, of course, is not to deny that China has functional relationships with a number of states. Like any great country, China depends on other nations for markets and as a source of raw materials. Trade is central to China’s continuing need to develop its economy, which in turn has provided it with international influence. Yet even granting that need for trading partners, when it comes to forming a picture of its global environment, China’s thinkers and policymakers seem to naturally subordinate their perception of these relationships to the political competition with the United States. We can imagine these foreign connections falling mainly into three categories, differentiated by their role in the Sino-U.S. competition for regional and global influence. The first category is client states, primarily North Korea, but also Sudan or until recently Burma. These are countries dependent on China for critical aid and support, but also ones directly antagonistic to U.S. interests. They are thus, in this formulation, “closest” to the U.S.-China competition, and serve to absorb large amounts of U.S. attention and planning. Beijing, while it may not control its North Korean clients, nonetheless recognizes the utility of propping up the Kim regime, as it did in supplying arms to Sudan’s junta. A subset of this first category is states that are not clients of China, but whose opposition to U.S. policies makes them an attractive target for Chinese support. Iran (whose energy supplies are crucial for China) may play this role the best, as Beijing’s constant refusal to support significant sanctions against Tehran has helped drag out the crisis over its nuclear program for years. A second category, and farther from direct U.S. interests, are those countries with which China is developing particularly close trade relationships. Obviously, economic concerns are the major driver here, but there is an element of competition with the United States that creeps into these arrangements, as well. At one level, China’s pursuit of low-quality trade agreements (leaving out high standards of workers’ rights, consumer quality protections, intellectual property rights, etc. ), serves as an alternate vision of trade architecture to those promoted by the United States. The trade agreements with African countries are also designed to garner predominant influence for Beijing on that continent, as is the one with ASEAN that came into force in 2010. There is a strategic element to China’s trade ties that provides not only the country with economically crucial markets, but political returns as well. Politically oriented multilateral efforts form the third category of China’s foreign relations. Because these are by nature diffuse, and less amenable to the type of direct influence China can exert in bilateral or even multilateral trade relations, they are the “farthest” from Beijing’s competition with Washington, but they are increasingly significant. Beijing is playing a long game in forums it does not control, such as the East Asian Summit or ASEAN Regional Forum. While it encountered significant pushback in 2010 from its more assertive stances, it still is invested in trying to play a leading role that can shape the development of these groupings and limit them from highlighting liberal issues. On the other hand, China continues to commit to alternate mechanisms of more like-minded states, such as the largely symbolic Shanghai Cooperation Organization, in order to provide the fiction of a counterbalance to America’s informal liberal bloc in Asia. Yet in none of these three categories is China forging working relationships based on trust or a sense of truly shared values. That is because each of them (with caveats for the economic ties) is approached from a utilitarian perspective of their role in buttressing China’s position relative to the United States. The prism of America plays a dominant role in shaping China’s external strategy and policymaking. Smaller nations are to be played as pawns in a larger game, but otherwise dismissed as irrelevant. No concept of equal relations or genuinely shared interests (other than trade) seems to come into play. None of this is to argue that China does not have legitimate national interests or domestic influences on its foreign policy. Nor does it downplay the country’s need for growth and trade relationships that will help develop the economy. But the expression of these interests and influences gets twisted up with the monofocus on America. Certainly that is how Chinese express themselves in private and public meetings. This complicates U.S.-China relations in unexpected ways. First, it means that Beijing will interpret any U.S. policies in the region as aimed at China, in a mirror-reflection of its own perspective. No U.S. protestations about broader regional aims, humanitarian or development goals, or interests in general security are likely to convince Chinese counterparts. Second, Beijing’s willingness to use pawns in its game with Washington means that it will constantly throw up obstacles to regional or global stability. An obstreperous junta makes a perfect foil to American efforts to promote democracy or focus on economic development. Finally, China’s focus on America will continue to be the main reason it concentrates on military modernization, in order to achieve the ultimate goal of acting unhindered by U.S. pressure. All this leads to the conclusion that those who seek the development of a mature working relationship between China and America that is built on trust are likely to be disappointed. China will continue to bide its time and would be wise not to antagonize its neighbors. It may work with the United States on lower order priorities, such as piracy, climate change, and the like. However, until it no longer views the world through an American prism, it is unlikely to adopt a truly cooperative attitude that would herald the birth of a new era in Sino-U.S. ties. Dr. Michael Auslin is a scholar in Asian and security studies at the American Enterprise Institute in Washington. Beijing has long interwoven strands of victimization and self-righteousness into Chinese nationalism, which have made compromise more difficult.